Montserrat Jesuit Retreat House and St. Edmund Campion Jesuit Spirituality Center offer a welcoming and warm campus to all who come here. The lakeside facilities are a place of peace and quiet. Prayer comes as naturally as breathing as one walks the grounds. The chapel serves as the location for Eucharistic Celebrations and as the primary conference space for Montserrat's silent retreats. The chapel can comfortably seat approximatly one hundred persons. The Blessed Sacrament is reserved in the Chapel. The beautiful stained glass windows provide a warm and welcoming light to the Chapel. Montserrat's replica of the original statue of Our Lady of Montserrat has her honored place near the altar of the chapel. The first floor of Assumption Hall has an elegant library overlooking the lake. Retreatants relax, read, and pray in the comfortable quiet space. The hall also includes private conference rooms for one-on-one consultation. 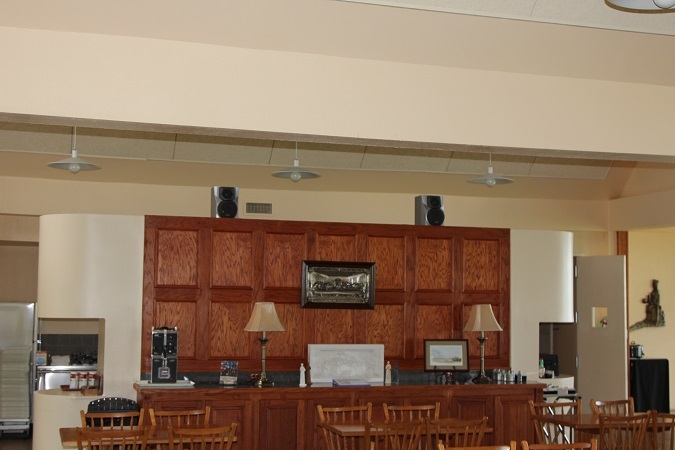 The large library room can facilitate meetings of up to 50 and is sometimes used for workshop and consultation retreats. At Montserrat, retreatants and guests enjoy private rooms and baths with individual heating and air conditioning. All rooms are furnished with a single beds with linens, and a small desk for study or writing. Rooms in Advent Hall are furnished with two twin beds for our couples retreats or for participants attending conferences. Loyola Hall: a large meeting room for up to 120 persons seated theatre style, or 64 persons seated at tables. Campion Commons: a medium-sized meeting room for up to 60-70 persons seated theatre style, or 40 persons seated at tables. This area includes a kitchen scullery. Campion altar: an open altar in Loyola Hall where Mass may be celebrated for participants in meetings. Board Room: comfortably accommodates 12-16 persons for the smaller meetings. Colombiere Library: beautifully appointed space for quiet and prayer, or one- to- one conferences. Administrative offices of Montserrat's staff. All meals are taken here and the space remains open for drinks and snacks throughout the day. Retreatants enjoy the view looking out through glass walls onto the lawn and lake. The space may be used for conferences and seminars with up to 100 participants. At Montserrat, you will feel invited out for a walk, or to sit on the pier, or rest in the outdoor Adirondack chairs or bench swing. The weather is regularly very pleasant and the lake provides peaceful waters maintaining a nice airy and open feel here. The surrounding trees help provide privacy and inspire you to look and listen.